RapidBox Review 2019: Is RapidBox a Good Hosting? RapidBox is a U.S. based dedicated hosting provider. Founded in 2014, they provide processors that can handle some of the most intense web traffic. They also offer customers the ability to scale the features they use to their budget. Their hosting servers are not intended for personal and small business websites. In operation for over four years and based in the U.S., RapidBox offers dedicated servers to companies that have traffic-intensive websites or need a hosting solution for games, communication, etc. Personal blog and small businesses will have to look elsewhere as the servers provided are not intended for entry level websites. They offer Intel i3 processor on the servers. While this is not the fastest on the market, it can handle most heavy website traffic. They work with Ubuntu LTS 14.04, CentOS 6, and CentOS 7. As a new customer, you can only get five dedicated servers. If you need more, you’ll have to wait for two months. Then, the threshold goes up, to 25 servers. I especially like their setup time – it’s only five minutes. This is impressive for dedicated servers. If at any point you wish to move to another hosting partner or take your files off the web, RapidBox will use a deep scrub cycle to shred all of your previous data to ensure your privacy. Another plus is that they block spam and other hazards. On all servers, outbound port 25 is blocked by default. This is good for safety; it means that you can’t send emails until you set up an email relay from your account to either Gmail, Live.com, or Yahoo. If you’re not an expert, the RapidBox team can configure it for you. RapidBox offers dedicated servers at the price that VPS is offered by most web hosting companies. Although they don’t provide the latest processor, the SSD storage, RAM, and bandwidth they provide for the price offered make them worthwhile. Also, you can plan your pricing. You can choose to pay a fixed fee monthly or hourly. Either method has its perks. If you choose monthly, you get a 10% discount. With the hourly payment, you’re billed for only 28 days in a month. You can also spin up new servers or spin them down at any time. This enables you to save up to 35% of your money as you place servers you don’t need on hibernate mode. Another big plus is their free trial. You can test up to three servers to see how well their servers work without presenting any credit card information. If you need customer support, you can contact them through email or phone call at any time, 24/7. 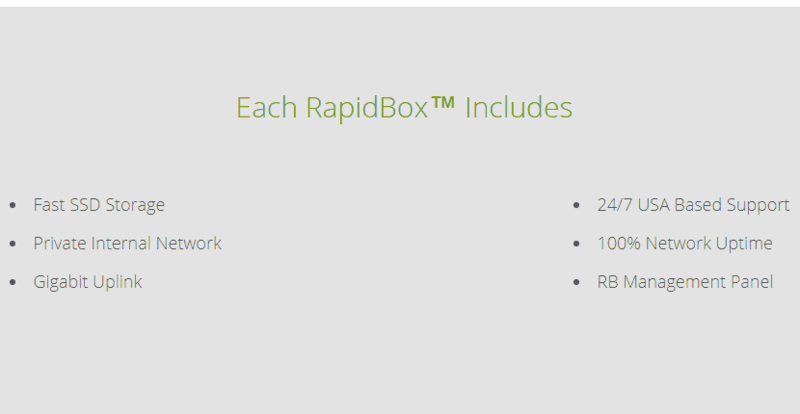 RapidBox offers dedicated hosting with a cost-effective pricing model. Large businesses and companies in need of dedicated servers will enjoy the ability to scale effectively to their budget while reducing costs. Although the processors are not the latest, they do provide support for a good number of operating systems, efficient SSD storage, and a 100% uptime guarantee. Wondering how RapidBox stacks up against other Web Hosting companies? Enter any other Web Hosting company and we will give you a side-by-side comparison.